This is a simple to use, web page based CD-ROM, well packed with information. I found it easy to navigate and everything seems well indexed. Philippe Faucon is based in Phoenix Arizona and the cultivation advice will be particularly valuable for people living in similar hot arid climates. It should be particularly noted that the very hot summers with high night time temperatures can make some succulents such as the Crassulaceae very difficult to grow as their CAM photosynthesis ceases to function properly. 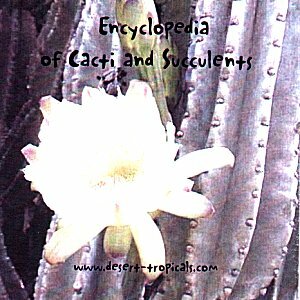 A large number of species of cacti and succulents are illustrated and information about the species and cultivation advice is given for each.